Thiruvilliputhur also now known as SriVilliputhur is one of the 108 divya desams. It is to be noted that, Thiruppavai, one of the important devotional Tamil pasurams (stanzas),part of Dhivya Prabhandam was written here by Andal. The temple consists of two main sannidhis. 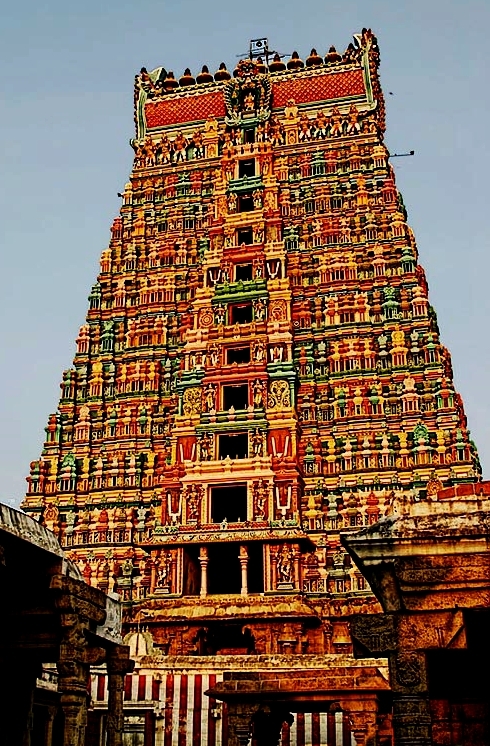 The first one is called Vadabadra saayanar and second is the as Andal sannidhi.The temple tower of Srivilliputhur is 11-tiered tower structure. The tower of this temple is 192 feet high and is the official symbol of the Government of Tamil Nadu. It is said to have been built by Periyaazhvar during AD 765-815 according scriptures. Sri Andal temple is placed next to Vadabathre Saayi sannidhi. 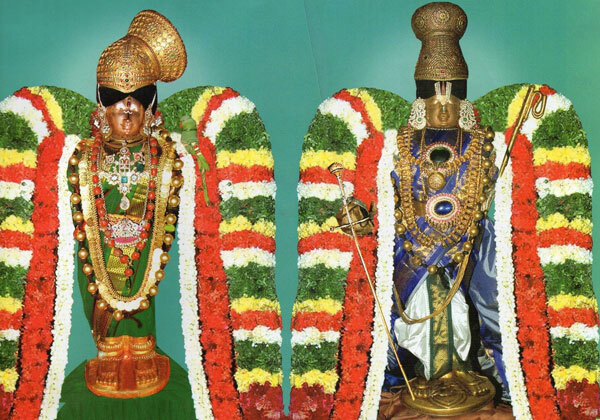 There are separate sannadhis for Sri Ramar, and Sri Srinivasa Perumal. After crossing the Kodi maram (Flag Pole), a mandapam named "Madhavi Mandapam" where you can see beautiful paintings of Lord Narayana. Next to it is the Mani Mandapam,Artha Mandapam and then the Moolavar sannadhi is situated. In Moolavar Sannadhi is seen in Kalyana Kolam along with Sri Andal and Garudan. The Garudan next to the Perumal and Thayar is an unique feature here as normally in all the Vaishnava temples, Garudan is found facing the perumal sannadhi. A separate idol of Sri Andal in the Nandhavanam (Garden) is seen indicating that she was born here at this garden. Periyalwar sannadhi is situated on the North side of the temple facing south. There are two tiers or floors in this temple. In the ground floor , Sri Narashimhar and the twelve Alwars are seen. On the upper floor is the Moolavar Vadabadhara Saayi sannadhi. Chakrathalwar, Sri Kannan and 'Allal Thavirtha piraan' utsavars are situatd. The Moolavar of this sthalam is Sri Vadabhadra Saayi also known as Rangamannar. The Moolavar is giving his seva in a Bhujanga sayanam posture facing east. Thayaar in this sthalam is Kothai Nachiyar (Andal) also known as Soodi Kodutha sudarkodi. Temple location Srivilliputhur is a small town. You can see the tower of the temple from anywhere in the town. Walkable from most of the places. This temple is situated in Virudhunagar district, Tamil Nadu. It is well connected by rail and road. The nearest airport is Madurai. From Srivilliputtoor station, the temple is around 3 kms. Where to Stay?There are budget hotels in Srivilliputhur. Where to Eat?There are no big restaurants in Srivilliputhur. However decent food are available in many of the restaurants. Milk pedas (pal gova) are famous here and is local delicacy akin to the Halwa of Tirunelveli.